After decades (yes, decades) of waiting for International Historical Research Associates to complete publication of the promised "Saga of the Sunsetters" history of the 38th Bomb Group (WWII), the 38th Bomb Group Association acquired permission to publish the book ourselves. Part of the agreement states that we can only sell the book at no profit to those who served in the 38th Bomb Group and their immediate family. Therefore, a limited number of books were printed and sent to those who had already paid IHRA for their books many years ago. At this time, the special printing has been sold out. We have all been anxiously awaiting to see Editor Larry Hickey's work that chronicles the history of the 38th. There are no guarantees that it will ever be published. Please visit International Historical Research Associates for more information about the commercial version of this book and to advocate for an immediate publishing date. Click here to access our web form to send a message to the president. 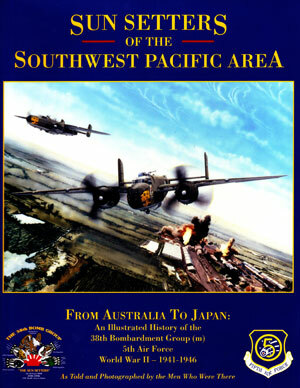 We still maintain the original 38th Bomb Group Association website put together by member Chris Guest. In case you are wondering how to access the original website, click here .